DESCRIPTION: For effectively sealing pipe penetrations on shingle roofs. 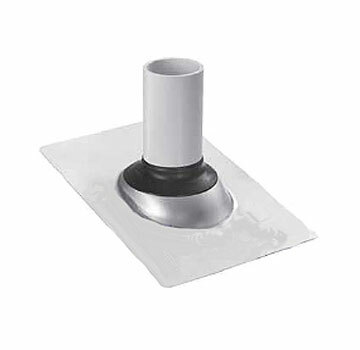 Shingle Roof Pipe Flashings provide permanent elastic seals at pipe penetrations. Optional sizes from 1- 1/4" to 4" round. Fits all types of shingle roofing systems. Fits up to a 40 degree slope. Portals Plus Shingle Flashings consists of an elastomeric collar locked into a nailable rigid base which integrates into the shingle roofing system. Shingle Flashings are the solution to temporary, leaky field- fabricated sheet metal and roof cement flashings.